FACE: Apply a medium coverage liquid foundation such as Physician’s Formula Organic Wear Liquid Foundation. Apply concealer where needed. L’Oreal Infallible Concealer is a nice all-purpose concealer. Lightly dust a translucent powder over the face such as Coty AirSpun Loose Powder. Cheeks are very pink. Apply a hot pink powder blush like NARS Powder Blush in Desire to the apples of cheeks. A little bit of this shade goes a long way. EYES: Brows are thin and penciled in. For a “waxy” authentic 1930’s brow look, apply a brow pencil and do not blend. I recommend Covergirl Brow Shaper. 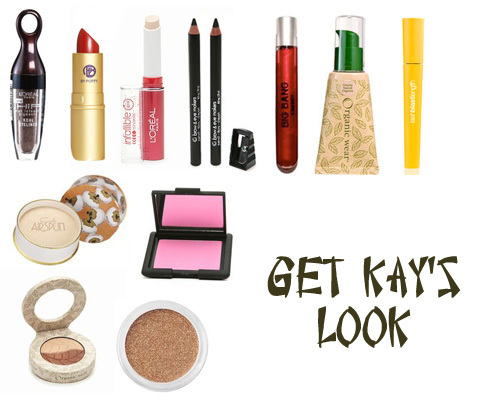 There is a Midnight Black for Kay’s look. Use Physician’s Formula Organic Wear Duo Eye Shadow in Brown Eyes. Apply the lightest shade, a soft warm ivory, from lash line to brow bone. Take the darker brown shade and blend into the crease. Take a small eyeshadow brush and line the bottom lashes with the darker brown shade used in the crease. Take a sheer gold shadow such as Bare Escentuals Bare Minerals Glimmer Eyeshadow in True Gold, and apply to the lid. Apply it sweeping from the side closest to the nose to the center of the lid. This creates a “glowing” look. Apply a brown kohl liner for a smoky look. Try something L’Oreal HIP Kohl Liner in Brown Kohl. Take a fine liner brush and dip it into the powder. Line eyes and smudge with a shadow brush. Apply liner to top and bottom lashes. Keep applying enough to you reach your desired level of “smokiness”. Apply a few coats of a black/brown mascara such as Covergirl Lash Blast Lengthening Mascara to top and bottom lashes. LIPS: Lips are red and glossy. Apply a sheerer red such as Lipstick Queen Lipstick in Red Saint. Apply a red lip gloss with shimmer. Apply Lipstick Queen Big Bang Theory Illusion Gloss in Energy over lipstick. A sheerer option is to use NARS Lip Gloss/Lip Stain Duo in Moon Fleet/Indian Red Coat with the stain and follow with the gloss. UPDATE: Post is old so some of these are no longer available.